Towards the end of 1905 Vauxhall had produced a relatively small number of cars that were all very similar in concept and especially in their appearance, the sloping front “V” shaped bonnet had become an easily recognisable feature of all the Companies automotive products. The engineering was simple and relatively reliable by the standards of the time, but the embryonic motor industry was evolving fast and Vauxhalls once quaint design was beginning to look out of date, the bonnet design also restricted some aspects of the engine ancillaries such as the long and slanted fuel feed for the cylinders. The 3-cylinder engine had evolved from the original single cylinder motor used in the first cars but was now being outclassed by rivals who had designed new power units that incorporated the latest developments in engine assembly. Four cylinder engines were becoming more and more widespread along with a fairly standard shared design feature which was a large upright honeycomb front radiator, all of which made the 3-cylinder Vauxhall 9hp look something of an oddball. Design work had started on a new Vauxhall 4-cylinder car shortly after Company moved to Luton. Unfortunately, the same principles were used as in previous engine development, this being an additional cylinder added to the previous 12-14hp 3-cylinder engine although there were some useful developments. The 4 “T” head cylinders were again cast individually and mounted on an aluminium crankcase with exhaust valves on the nearside & inlet on the offside all of which followed the established Vauxhall pattern. A bore of 3 3/4ins and stroke of 4 3/4ins stroke gave a total capacity of 3,436cc and producing 18bhp@950rpm, this made the engine the largest Vauxhall had offered for sale up to that time. Ignition was by Simms HT magneto and a mechanical governor working on the same principle as the 3-cylinder engine. The final drive was by the familiar chains both sides, the gear & bevel box was an enlarged version of the 12-14hp unit but now employed four speeds with top gear ratio of 3.6:1. The unusually low maximum engine speed was required to preserve the crankshaft, this despite the use of 5 main bearings, overall the engine showed no real technical progress over the 3-cylinder version and was still using primitive methods of lubrication and valve gear. The steel chassis used a wheelbase of 110ins, was 148ins long and 66ins wide, it was strengthened in order to ably cope with heavy enclosed bodywork which were all built by Morgan & Co of Leighton Buzzard. One point of interest about the chassis design was that it was the first Vauxhall to use a separate sub frame to carry the engine, something that would feature on the Company’s models for many years to come. Launched in October 1905 at the Olympia Motor Show the Vauxhall 18hp was displayed as a chassis, a side entrance Tonneau with removable Limousine top and also a full size display of the new 4-cylinder engine mounted on a plinth. Vauxhall only sold the chassis, with a price tag of £420, at this price it was outclassed by most other rivals of similar cost. The car was ponderous, heavy with coach built bodywork, slow and with chain drive quite noisy. 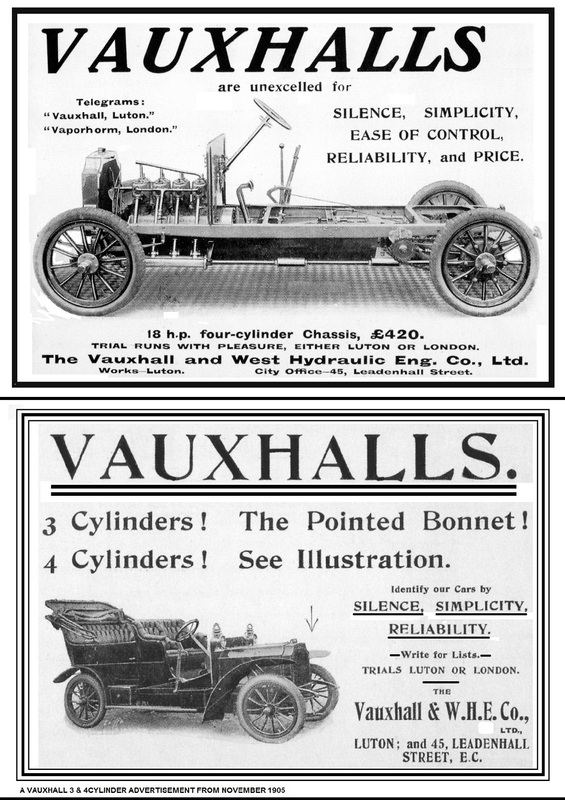 Not surprisingly only 12 examples were sold in the 2 years the Vauxhall 18hp was offered for sale, the last being delivered in November 1907. The only known competitive event that the Vauxhall 18hp participated in was by Rudolph Selz, a Company shareholder, who entered his own car (LC5553) in the Aston Hill hillclimb event on 30th June 1906 and came last with the slowest time in his class.